The Malpaso Dance Company in action. When one sees a great deal of dance, it’s always thrilling to experience a work that is richly unique in its movement vocabulary and is performed by a group of dancers who move in an exceptional way. I always hope to be totally caught up — delightfully submerged — in the artistry and creativity onstage, but it just doesn’t happen that often. But then unexpectedly, and for one delicious moment, it does. The occasion was Friday night at the Duncan Theatre in Lake Worth, where the Malpaso Dance Company presented the world premiere of Indomitable Waltz by Canadian choreographer Aszure Barton. What grabbed your dance heart and soul was the distinctly different movement that Barton created. It was totally engrossing. Finding moments in between the notes of the music, relaxed body parts moved harmoniously but in such surprisingly different directions that it made you wonder if these dancers had more joints and bones than regular people have. The company, which is based in Havana, is dedicated to bringing Cuban contemporary dance into the 21st century by working with top international choreographers and providing opportunities for upcoming Cuban choreographers. Working in a collective creative process, the company is led by resident choreographer and dancer Osnel Delgado, who together with Fernando Saéz and dancer Daileidys Carrazana founded the 16-member company in 2012. Unable to find funding in Cuba, the company has successfully connected themselves to very established sources here and regularly tours the United States. Clearly when Barton set this work on the company, she became part of Malpaso’s artistic family. To be able to create such an abundance of distinctive movement that is both simple and stunning at the same time is one thing, but to get an entire cast of eight to approach the subtly complex movement with the same rich nuances in their movement qualities is another thing entirely. Was Barton a great communicator or were the dancers great listeners? Most likely it was both, as the result was stunning. The musical selections that Barton chose were from an array of international contemporary composers: Romanian Alexander Balanescu, Briton Michael Nyman and German Nils Frahm. The title Indomitable Waltz may have come from the first engaging waltzes by Balanescu but then the musical selection departed to an almost strident-sounding string quartet by Nyman and ended with the ambient rhythm sounds of Frahm. The elegant quirkiness of the movement in Indomitable Waltz was performed with such polished refinement by the Malpaso dancers to the point where it was impossible to separate the artistry of the dancers from the artistry of the dance-maker. Performance and craftsmanship seamlessly fused into some very superb dance. 24 Hours and a Dog, the second piece of choreography on the program, was a marathon work created in 2013 by Delgado (in collaboration with the dancers) to a lively commissioned score by Grammy Award winner Arturo O’Farrill, pianist, composer, and director of the Afro Latin Jazz Orchestra. He created the score for Malpaso working alone with just his dog at his side in 24 hours, hence the name. In direct contrast to Indomitable Waltz, 24 Hours and a Dog was a non-stop blast of top-speed movement with not enough moments that changed things up. Admittedly, it was amazing to see these dancers dish out such a large dose of technical feats and sheer energy for the full 45 minutes of the work. It was impressive for those reasons but not as impactful as the previous work. In fact, it was a disservice to have the overly-lengthy 24 Hours and a Dog follow Indomitable Waltz as it had more of an program-opener quality to it. 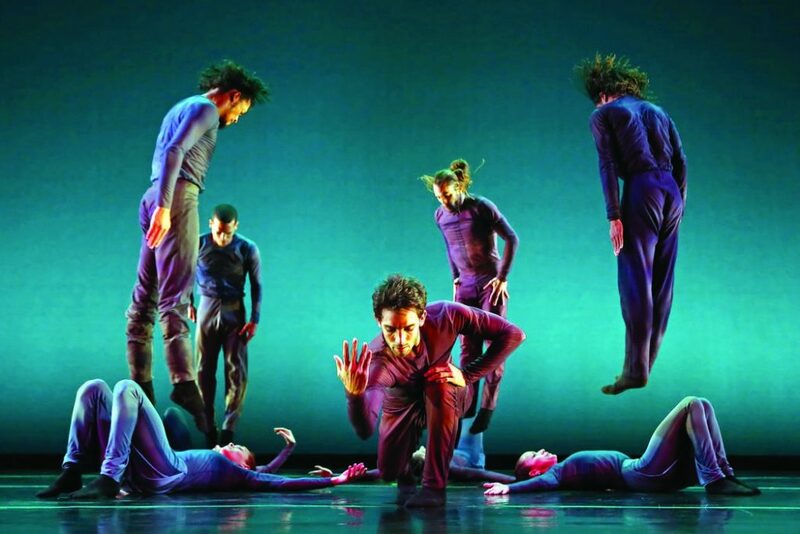 Delgado, the lanky choreographer and artistic director, performed in his own work, radiating a distinctive aura onstage as he danced with the nine other dancers, and his role took on an overseeing quality. At the beginning, he entered with a curious opening gesture — two fingers reached forward and were lifted to his nose as if he were smelling the water or the air. After a multitude of groupings that collected and divided countless times and were so chock-full of movement, he ended the work with the same curious gesture. Fortunately for us here in South Florida, the Malpaso Dance Company is appearing more often and in more venues in the near-by area. In Spanish, mal paso means misstep or wrong move, so don’t let yourself take a malpaso on Malpaso. It is worth keeping your eyes open because this vital, young company from Cuba is something not to be missed.